(KPL) The Embassy of Malaysia in Vientiane, the Lao PDR in collaboration with Education Malaysia held the “Study in Malaysia Education Fair 2018” at Vientiane High School on Sep 8, 2018. More than 400 guests and visitors comprising of Lao officials, headmasters, college directors, student counsellors, officials and Lao PDR students attended the event. The Guest of Honour was Assoc. Professor Dr. Sisamone Sithirajvongsa, Director of External Relations Department, Ministry of Education and Sports of the Lao PDR. In his welcome remarks, Ambassador of Malaysia to the Lao PDR, Mr. Mohd Aini Atan took the opportunity to express his appreciation to the Lao PDR government especially Ministry of Education and Sports of the Lao PDR for extending all the necessary support in making the event a reality. 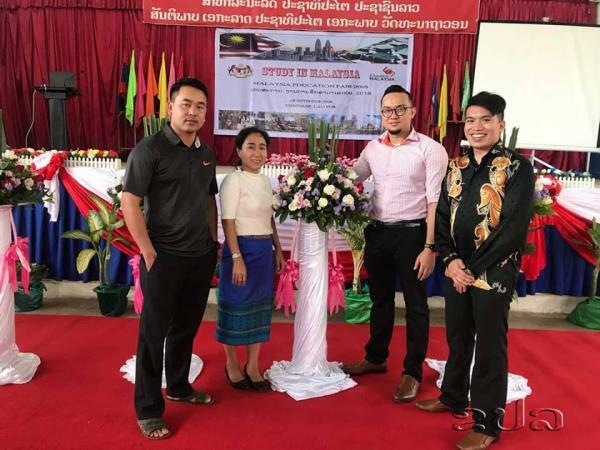 This was the first time that a Malaysia Education Fair was hosted at a local high school, a venue which is rich and monumental in term of history and has immensely contributed towards producing prominent individuals and leaders of the Lao PDR over the years. Vientiane High School is best remembered as one among the earliest schools in Laos. Mr. Mohd Aini Atan also noted that some of the guests attending the Opening Session, including Assoc. Professor Dr. Sisamone Sithirajvongsa, were Alumni of this school. More than 15 exhibitors had set-up booths to provide information and consultations for students to pursue their studies in Malaysia. Among them are National University of Malaysia, Nottingham University of Malaysia, Asia Pacific University of Technology & Innovation, HELP College of Arts and Technology, Nilai University, Raffles University Iskandar and SEGi University. Other renowned universities in Malaysia like International University and Colleges (INTI) and English Language Company (ELC) are represented by local educational promoter, Classy Education. In addition, several international and private schools in Vientiane also took part in the event namely Panyathip International School, Eastern Star International School, Kiettisack International School, Sabpanya Bilingual School and Magic Palms School. Some international schools had also participated in the stage performance during the opening of the event. Mr. Mohd Aini Atan was pleased to note that some students at these international schools competed in various competitions overseas including in Malaysia and won many awards. This orchestrated as how talented Lao PDR students were in performing arts. Education and capacity building programmes continue to be one of the main pillars of cooperation between both countries. In the field of education, Mr. Mohd Aini informed that more than 300 undergraduate students are interested to study in Malaysia each year, either through sponsorship or using their own funds. 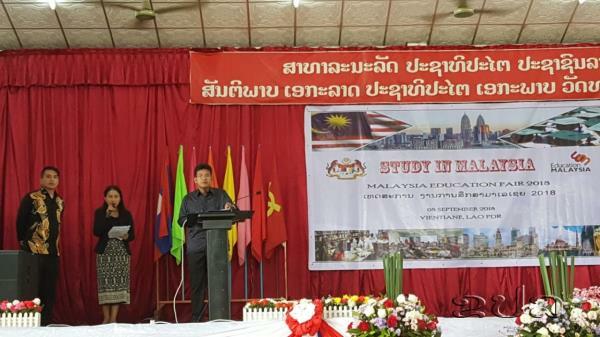 In addition, the number of students from Laos to study in Malaysia is expected to increase as there are more than 100 well known private and public universities in Malaysia. The Malaysian government has come up with a number of initiatives for students to study in Malaysia. These include the Malaysian Technical Cooperation Programme Scholarship offered to students wishing to pursue their Master and PhD programme as well special rates and privileges offered by various institutions of higher learning. A briefing was later conducted by Mr. Johan Arief Jaafar, First Secretary of the Embassy on opportunities offered under the MTCP programme for students to pursue their studies in Malaysia. In addition, both Education Malaysia and Tourism Malaysia had also set-up their booths. The presence of AirAsia booth was indeed welcomed by visitors as the low-cost airline served prominently in linking Vientiane and Kuala Lumpur through its daily flights, including 3 direct flight weekly for the routes KL-Vientiane-KL. Prior to the Education Fair, Mr. Mohd Aini Atan had met with Her Excellency Madam Sengdeuane Lachanthaboun, Minister of Education and Sports of the Lao PDR on 10 August 2018 and reaffirmed Malaysia’s commitment to enhance education cooperation with the Lao PDR. The appointment of Dr. Maszlee Malik as the new Minister of Education as well as the appointment Mr. Syed Saddiq Syed Abdul Rahman as the new Minister of Youth and Sports of Malaysia are viewed as timely in promoting education, sports and youth programme between Malaysia and the Lao PDR.